No. 1 individual shareholder at automaker discloses another sale of 14 million shares at below market prices. NEW YORK (CNNMoney.com) -- Billionaire investor Kirk Kerkorian said Thursday he sold another 14 million shares of General Motors, his second such sale this month, slashing his holdings in the world's largest automaker by a third. Shares of GM (up $0.01 to $29.51, Charts), which had been higher before the sale was revealed in an SEC filing, fell sharply immediately after the filing, then rebounded to be little changed in mid-afternoon trading. The stock was higher earlier on news that the automaker had completed its previously announced sale of 51 percent of its General Motors Acceptance Corp. finance unit to a group of buyers led by Cerberus FIM Investors. GM expects the deal to provide about $14 billion in net cash proceeds over three years. But it will also remove a significant source of income for the struggling automaker. The filing by Tracinda, Kerkorian's investment firm, said it had sold the shares for $28.75 each Tuesday, which was about 4 percent below the stock's low for the day. It's also 13 percent below the price of his previous sale of 14 million shares, and unlike his previous sale is for less than the average $30.22 a share he had paid for his 56 million-share stake. Shares of GM have tumbled about 19 percent since Nov. 17, the day before Kerkorian started dumping shares. But it's still the best performer of the 30 stocks in the Dow industrials this year, up about 50 percent year-to-date. Kerkorian's filing did not give any reason for the sale and a spokeswoman said he had no comment beyond the filing. 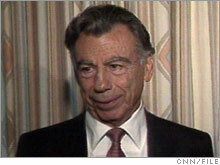 Even with the sale, Kerkorian remains the largest individual shareholder of the automaker and the No. 5 shareholder overall behind four institutional shareholders. On the day the previous sale was disclosed, Kerkorian filed a tender offer to increase his stake in casino operator MGM Mirage (Charts), of which he was already the majority shareholder. He offered what was then a 12 percent premium to buy an additional 15 million shares, an offer that would cost him $825 million. The two GM sales announced this month are worth about $865 million. GM spokeswoman Gina Proia had limited comment on the filing, saying only, "It's our practice not to speculate on the motivations, actions or potential actions of shareholders." Before these two sales, Kerkorian had held about 9.9 percent of GM shares, and had sought permission to add to those holdings. With the sales, Kerkorian now holds just less than 5 percent. He has been critical of GM management for some time, even as his filings spoke of a desire to increase his holdings. He battled with management of GM, pushing it to join an alliance with Japanese automaker Nissan (Charts) and French automaker Renault, which already have cross-ownership of each other's shares. After holding almost three months of talks, GM management pulled out of the discussions, saying the automaker would have to be compensated for joining such an alliance. The move brought criticism from Kerkorian and the resignation of Kerkorian adviser, Jerry York, from the GM board. York, in a letter to GM Chairman and CEO Rick Wagoner, said he had, "grave reservations concerning the ability of the company's current business model to successfully compete with those of Asian producers." GM, Ford (Charts) and the Chrysler Group unit of DaimlerChrysler (Charts) are all losing money on their core North American automotive operations, and have been losing U.S. market share to Japanese competitors such as Toyota Motor (Charts), as well as Korean and some European automakers.